So I got these rub-ons at the end of January, and I only used them for the first time today! It's not that I didn't want to, but since they are a finite item, I was guilty of hoarding. Once again, I sat down and attempted to create something amazing. I didn't know where to start, so I checked out this week's challenges. The colour challenge immediately caught my eye. It was to use River Rock, Basic Black, and Whisper White. Well, these rub-ons come in both white and black, perfect! I cut out a square piece of the river rock and got to work. It was really simple, but I love how it turned out. I applied some rub-ons to a few black buttons and added those in there for a bit of something different. I have some envelopes that are 5x5, so I figured I'd make the card a bit smaller so I could use one of them. I added a few rub-ons to the envelopes for that little extra something special. As a side note, I have to say I was really impressed with the quality of the rub-ons. They didn't come off on my warm hands, yet they applied to the paper and buttons really easily! Fantastic. Well, I hadn't posted for a few days, so I set out to create something amazing tonight... It didn't happen. I cut out my stuff, arranged and rearranged. I didn't tape anything down, it just wasn't coming together. So instead, I'm sharing a glimpse into something out of my usual style, that I started on the weekend. It's not done yet, but it gives you an idea for all those PLASTIC BOXES your clear stamps come packaged in!!! Okay, so after CHA, I noticed the whole fun clear albums trend is still in full force. Well, I haven't had time to make it out to my LSS lately, so I'm not even sure if they carry them. So what do I do??? I attempt to make my own! Regular acetate is too lightweight for something like this. It could work, but I wanted something sturdier. Well, does anybody else keep all their PaperTrey Ink plastic boxes? I did... They are a stronger plastic then regular acetate. So I cut them into flat, usable panels under 6 inches in width and ran them through the Cuttlebug with the scalloped square Nestabilities. It required a bit of elbow grease, but it cut just fine (I did do two runs through the 'bug: forward, then backwards). Next, I punched out a hole with the Crop-a-dile and found a binder ring. So far I've only done one little page. I used Basic Grey papers and rub-ons. I also used some Heidi Swapp rub-ons. The idea is that it's a title page for "Bright (the light bulb) Ideas". I thought it might be fun to capture some sarcastic type quotes, you know the "Thank you very much Captain Obvious" moments, in a mini-album. However, I'm not committed to that 100%. This was just a test run, me playing around with product I have, but never use. Anyway, I hope you've enjoyed my rambling, and I hope I've inspired you to take a stab at your own mini clear album! Monday is Jan Marie's birthday and she's throwing a party and giving out prizes. Smaller gifts throughout the 24 hour period. There will be a random drawing throughout the day and the big prize winners will be announced Tuesday. 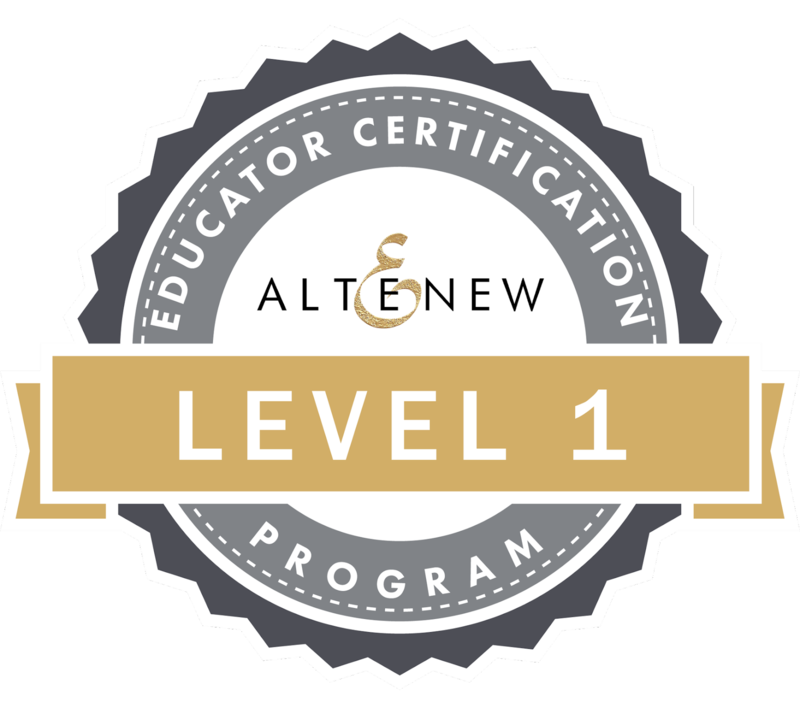 Join us in celebrating! Today, while out on a general craft supply run, I found this mini "Pretties" kit at Dollarama. It has 30 fabric flowers and 15 rhinestone brads, for $1.00. I didn't bother to see if it came in any other colours (what was I thinking, right!). This one has white, some oranges, and pink. Anyway, I was inspired to use the flowers right away. 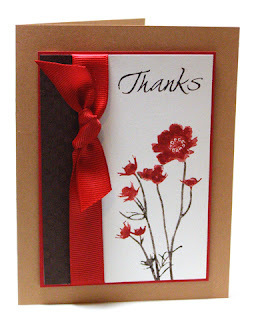 I have a hard time using flowers as an embellishment on a card, but not as the focus. 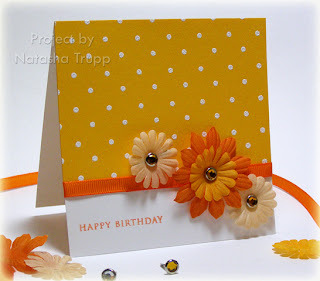 I stamped the Polka Dot Background on yellow and embossed it with white to really make those dots pop. Then I arranged my flowers just so, added a small greeting, and that was that. I figured I'd stage the photo, since the items in the kit work so well for that sort of thing. Stamps: Polka Dot Background, Borders & Corners monogram ed. I received these adorable Cat's Pajamas stamps last Thursday, but I only had a chance to break them open today. With this ridiculous cold and other assignments, I just didn't get to them. So I hope you don't mind seeing some love themed cards after Valentine's Day. I was never a fan of V-Day anyway. If you love someone, let them know whenever and frequently, not when the industry wants you to! This card uses both Puppy Love and Loving Mew. 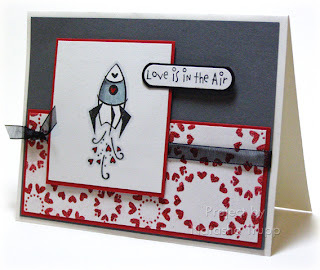 The rocket ship and saying are from Puppy Love, the 3 heart circle backgrounds are from Loving Mew. I coloured the rocket ship with SU! markers, then outlined it with a 10% cool grey prismacolor marker. I really love that effect on retro-style images, like these ones. I made my background paper by stamping the 3 heart circles in red craft ink, then embossing with gel-a-tins' ruby slippers gelly glitter. The sentiment was cut out with a word window punch, then I used the circle punch trick to get a nice mat for it. Accessories, etc. : Black organdy ribbon, pop dots, word window punch, 1/2'' circle punch, prismacolor marker, ruby red gelly glitter. 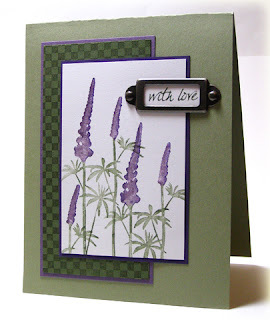 Thanks for all those knowledgeable stampers out there, the flowers were lupines! I have some more silhouette flowers for you today. I was feeling a real red, chocolate chip, and creamy caramel sort of colour scheme, so that's what I did. The first card is a layout that I never tire of. 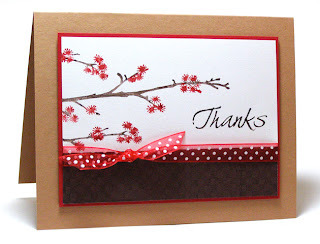 I stamped the branches horizontally, added a sentiment, and made some more of my own designer paper with the mini-check background. I really love this layout, as I've said hundreds of times by now, for its versatility. You really can use any image, sentiment, or theme with this layout. So next, I still wanted to do something in those colours. I thought, why not turn my favorite layout 90 degrees? I'm surprised I haven't done that sooner! I had to play around with where the sentiment and the side panel worked best, but the layout still works! I found that the wide grosgrain worked better on this one because the bulkier knot didn't get in the way of any of the flowers. It's that time again! The 20th of the month means it's time for a Dirty Challenge. 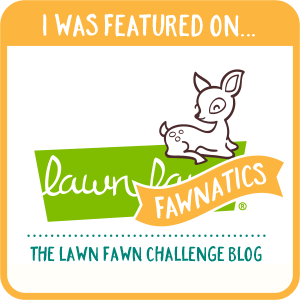 This month's challenge, "Give a Shout Out!" Challenge Focus: Stamps Designed by Fellow Dirty Girls. -OR- alternate option - use any fellow Dirty Girl's galllery creation as an inspiration to semi-CASE something of your own (be sure to link it in your post). I decided to use this lovely floral image by Anna. I coloured it with Copic markers in spring colours then added some glitter to cheer it up some more. 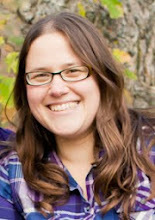 The layout is based off of this one by Valerie Stangle. Be sure to check out the other creations here! 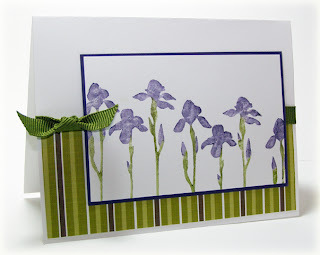 I've got 2 more cards for you today, featuring Starving Artistamps' new Silhouette Flowers. I saw this one of some irises and had to have it! Irises are my favorite flower, I love their vibrant colours, the variety of colours, and the smell of the larger ones. For this card, I found some patterned paper, then picked my inks to match. I was leaning towards doing yellow irises, but couldn't find any paper that fit. 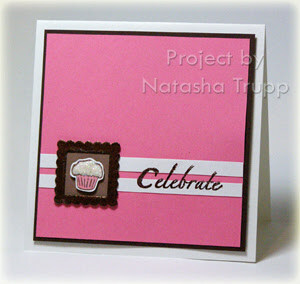 Is there anybody else out there who cannot get enough of striped patterned paper?? I went with a simple layout to really showcase those flowers. My next card features some more of the new silhouettes. I'm not sure what these ones are, but they seemed like they should be purple too! I inked up the flowers with Perfect Plum, then gently added in some Elegant Eggplant. Likewise, the leaves and stems were inked up with Mellow Moss, then I added in a bit of Always Artichoke. I made my own patterned background paper using the mini-check background. I added a hodgepodge framed sentiment and that was it! I really like this layout, I only wish I had more hodgepodge pieces so I could do more! 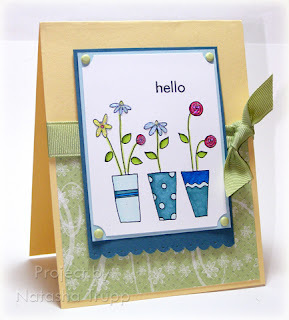 First up, I've got some lovely spring themed cards featuring some canaries from Starving Artistamps. These birds are absolutely delightful. I got out my twinkling H20s and watercoloured the images. 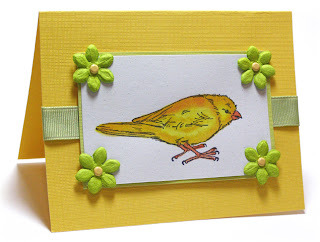 For the first card, I went with the traditional yellow canary. I paired that with some spring green primas and ribbon. 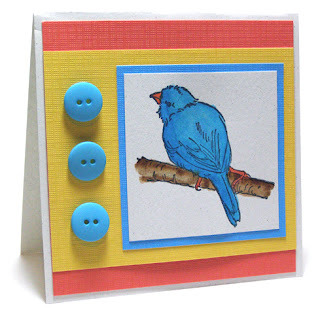 The second card, I was going for a "bluebird on my window" vibe. I found some nice bright colours from the DCWV Brights stack and paired some turquoise buttons with it for this cute 4.25 square layout. For my third card, I was going for more of a sketched feel. 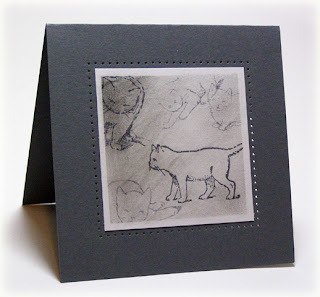 I used the Cats sheet from Starving Artistamps. First I reversed mask a square. I dabbed my versamark pad all over, then spread grey and black chalks all over the square. Next, I stamped various cat images using the generation stamping technique. I really like it, I think it's got a ripped out of a sketchbook vibe. I finished off the card by surrounding the main image with a frame of piercing. I just recently got these Pop Up Letters from gel-a-tins. 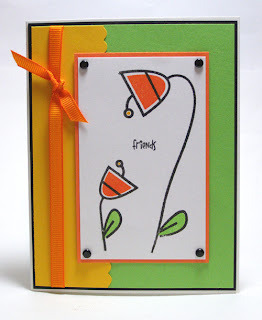 They are so bubbly and fun that I couldn't make anything but a happy card. There's not much green around here (missing it already after my week in California), so I felt the need for green in any way I could manage. I went with Glorious Green and Green Galore and added in some Robin's Nest Dew Drops. I've never used these before, but have certainly heard a lot of buzz about them. The colours I received didn't seem so "bling-tastic", instead they seemed more glossy and water drop-like (which is what their name would imply). 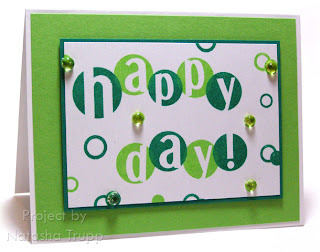 However, the water drop look worked on this all-around bubbly card. One thing I like about lowercase alphabet sets is that there is always an exclamation point found by flipping the letter i. The entire word panel is popped up on pop dots. I got home late Thursday night. CHA went well! However, the cold that I was fighting while there is back with a vengeance. So despite having access to all my craft supplies again, I just haven't had the energy or motivation to do much. I put together this simple monogram card using gel-a-tins Monogram Alphabet and circles from You Spin Me Round. 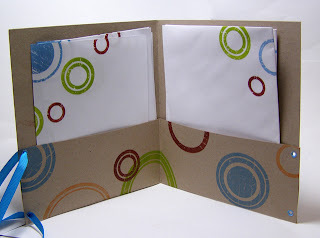 I thought the soft tones of the Cool Caribbean would be nice on the Confetti White cardstock. The large circle was cut out with a nestability circle die. The letter image is popped up with a pop dot. Well, tomorrow I'm off to California for CHA. I'll be in the gel-a-tins booth (#1350). I cannot wait for some nice non-winter weather! I will not be updating until I'm back next week, on the 14th or 15th. 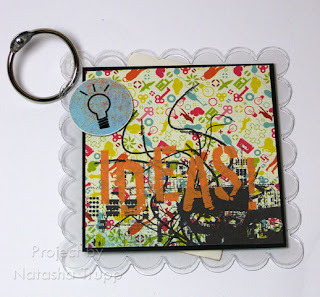 There are some cool new distressed style clear stamps coming out from gel-a-tins. This set is called Spin Cycle. It has several different sizes and combinations of distressed circle images. The thing I love about circles is how versatile they are, you really can use them for everything! The first card I made uses another distressed set, Weathered Crate Numbers. I stamped the numbers first, then masked them, and stamped various circles all around in other Earth tones. This makes a nice and quick masculine birthday card. Just fill in the numbers with whatever age you need! My second project is a little stationary set. I loved the look of these circles in these colours, so I went about stamping a Kraft 8.5x11 sheet of paper and folding into a small folder. Next, I cut up some printer paper and stamped the edges of those, as well as some matching envelope. You could just as easily make note cards instead of paper. It was super quick and would make a sharp looking gift for any writer you know. 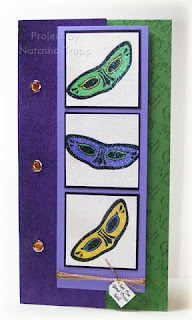 Well, today is Mardi Gras, so I thought it was best to post a card celebrating the holiday! I used Beate's weekend sketch as my starting point. I didn't end up with the exact proportions because I wanted to keep the masks in 2x2 squares. I stamped the masks, then coloured them in with gel pens (we all have them, and have for so long, it's time to start using them, lol!). Next, I wanted even more sparkle, so I inked the squares with versamark and then embossed Pearly Sparkle embossing powder over top. I found some metallic purple paper and rhinestone brads from my collection to go with the theme. The little white tag is polyshrink. I stamped "Let The Good Times Roll" on there, then shrunk it down and tied it one with some gold cord. This card is quite big, 8x4.25! I just received the all-clear to post some gel-a-tins CHA sneak peaks. This set, Spring Garden, was a lot of fun to work with. 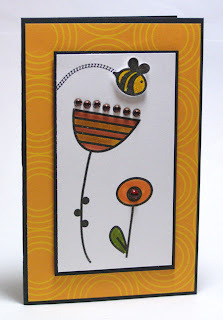 It's bold, whimsy, and can work on cards or scrapbooking. It also goes nicely with the gelly gems. This set has 2 different ways of colouring in the flowers. There are solid stamps that fit inside the flowers and leaves, or you can colour them in with markers or some other medium. Here are a few cards I made with this set. It definitely said BRIGHT COLOURS to me, so that's what I used! I used some Scenic Route paper for a background and popped the colours with a touch of black. There are gems all along the one flower top, as well as the center of the other flower. 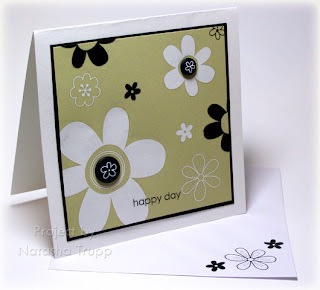 For the second card, I played around with changing the shape of the flowers. The one flower is quite tall, but being a clear stamp, you can manipulate it to fit your canvas. I thought it was cute to have the two flowers kind of looking at each other with the phrase friends. Again I brought some black into it to really make the bright colours pop!